WASHINGTON, D.C. (May 24, 2018) – “Hump Day” just got a little sweeter! 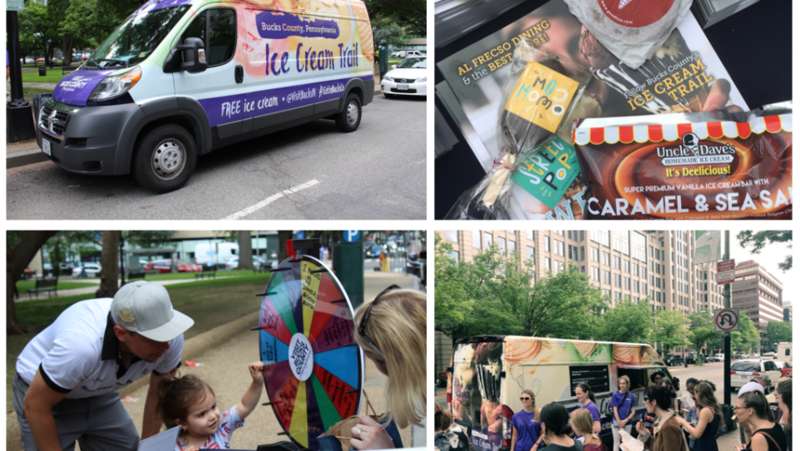 Visit Bucks County, the official tourism promotion agency of Bucks County, Pennsylvania, surprised passersby in Washington, D.C. with 3,000 pieces of free ice cream on Wednesday, May 23rd to promote the ‘Bucks County Ice Cream Trail’ and summer getaways to the area. A custom-wrapped ice cream truck bearing the Ice Cream Trail design was stationed in Franklin Square Park, a busy public space with food trucks downtown, from 11:00 AM to 4:00 PM. VBC staff had the opportunity to talk one-on-one with D.C. locals and distribute the Spring/Summer issue of our food and beverage magazine Well Seasoned, and a copy of our brand-new destination brochure. The sweet treats were: Vanilla dipped in Dark Chocolate bars from Owowcow, Caramel and Sea Salt dipped in Dark Chocolate bars from Uncle Dave’s Homemade Ice Cream and Ice Cream Sandwiches from Goodnoe’s Farm Dairy Bar. Those that stopped by had a chance to win tickets to a Bucks County attraction or $25 gas gift card by spinning a prize wheel. Prizes included nearly 100 admissions to various Bucks County locations: Aldie Mansion, Bucks County Children’s Museum, Ghost Tours of New Hope, James A. Michener Art Museum, Mercer Museum & Fonthill Castle, Moravian Pottery & Tile Works, and The Washington House Hotel. For more information contact alexaj@visitbuckscounty.com, 215-639-0030 x 227.